What triggered two teenagers to savagely assault a man leaving a gay bar? What kind of men are they now in their 30s? Rudy Dallmann, 40, single, choosing isolation in rural Massachusetts as a self-employed gardener, is goaded by his best friend Tex, a social activist, to finally “get on the record” this crime never prosecuted. Rudy goes further: He tracks these men down, one at a time, coming to terms with them and himself in the process. “Compelling, universal story. Alther is truly gifted. 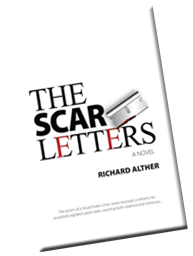 Bookreview.com considers The Scar Letters a must-read. RICHARD ALTHER’S first two novels are THE DECADE OF BLIND DATES and SIEGFRIED FOLLIES. He is also a Master’s Swimmer and exhibiting painter, living in Vermont and Southern California with his husband Ray Repp.